Part Two: The Primatologist And The Entrepreneur We learn how palm oil development threatens Borneo’s Seruyan Forest, and we meet the primatologist and the entrepreneur intent on saving it. Part Three: Todd Lemons: Ecosystem Entrepreneur We meet Todd Lemons and learn how he became acquainted with forest carbon — learning in the process a bit about forest carbon ourselves. Part Four: Wrestling With Orangutans: The Genesis Of The Rimba-Raya REDD Project We listen in on the first face-to-face meeting between Birute Galdikas and Todd Lemons, and learn what drove them to form their historic partnership. Part Five: Rimba Raya Takes Shape We follow Birute Galdikas as she navigates Indonesia’s political structures and Todd Lemons as he reaches out to businesses and scientists to lay the groundwork of what became the Rimba Raya REDD project. Meanwhile, we learn of steps that President Susilo Bambang Yudhoyono is taking to meet the challenge on the national level. Part Six: The Challenge of Sustainable Palm Oil We examine the demand side of the equation and learn why past efforts to promote sustainable palm-oil development have failed. We then learn how current efforts differ from those of the past, and see how they dovetail with Indonesia’s efforts to execute the largest land-swap in history. Part Seven: The Land Swap We conclude by wrapping up the various strings and seeing how they all converge in the government’s REDD+ Agency. We take stock of the agency’s efforts to-date, and examine the challenges that lie ahead. When Todd Lemons showed up on Birutė Galdikas’s doorstep in 2007, she had no idea who he was or why he’d come all the way to the island of Borneo on a hunch. They ended up forging a partnership that created the Rimba Raya REDD project, saved the Seruyan Forest, and provided a template for others to follow suit. 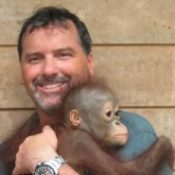 7 July 2014 | Todd Lemons spent 15 years working in sustainable forestry before he ever set foot on Borneo, and he thought he knew what a healthy forest looked like. So when he passed through a patchwork of palm-oil plantations and second-growth native forests on his way to Tanjung Puting National Park, his heart sank. “Quite frankly, compared to sustainably-logged [secondary] forests I had gotten used to in the Amazon Basin, this one looked scraggly,” he says – and scraggly could ruin everything, because his plan to save the Seruyan Forest hinged on it being full of carbon, which to him meant plump, tall or both. If the Seruyan itself looked anything like the forest he was driving through, he thought, this whole trip is for naught. The year was 2007, and the world still seemed intent on forging a global solution to climate change by the end of 2009. The global economic crisis hadn’t yet pushed climate change off the front pages, and major media outlets had “discovered” that deforestation generated at least 15% of all greenhouse gas emissions – and possibly more. For Lemons, there was something else happening, too: his daughter had gone off to 1st grade, and his son had just started kindergarten. It was the latest epiphany in a life of many twists and turns that began with romantic notions of the Amazon Rainforest, fed by Lemons’ grandfather’s tales of his own adventures in Guyana and nourished on a steady diet of National Geographic magazine. It was in National Geographic that he first learned of the woman he was on his way to meet: Birute Galdikas, who had been rescuing orphaned orangutans on the island since the early 1970s. Lemons graduated from college a few years after reading about Galdikas, and then in the early 1980s he followed in his grandfather’s footsteps – first to Guyana, then to Chile and eventually to Brazil and Bolivia, where he got a job sourcing hardwoods for major American furniture dealers. Todd Lemons walks through a freshly-destroyed patch of forest. He likens the experience to that of a committed meat-eater who wanders into an unregulated slaughterhouse. He became incensed – not just at the environmental destruction, but at the pointlessness of it all. He implemented a “cut-to-size” program, which involved whittling the trees into smaller pieces designed to fit specific units of furniture before shipping the wood. As a result, he slashed the volume of trees that were destroyed but increased the volume of semi-finished products – and developed a lifelong obsession with finding economically viable solutions to environmental challenges. In 2003, Lemons found himself managing a million-acre plantation forest in China as the world was gearing up for the 2005 implementation of the Kyoto Protocol, in which nearly 40 developed countries agreed to slash greenhouse gas emissions, and to help developing countries do the same. The Protocol, he learned, made it possible for companies that emit greenhouse gasses to reduce their carbon footprints by purchasing carbon offsets that reduce emissions elsewhere. It also made it possible for companies to generate carbon offsets by planting new trees (“afforestation”) or reestablishing lost forest (“reforestation”). His bosses asked him to find out if they could use carbon offsets to finance the expansion of their plantation. Plus, he adds, it just didn’t feel right. Birute Galdikas, Siswei and Todd Lemons share a meal. That, he later learned was a concept known as additionality: carbon markets don’t pay for business as usual. To earn carbon offsets, a developer has to prove that the finance for carbon reduction makes the reduction possible. For Lemons, “additionality” meant that even if the payments were higher, his company wouldn’t have qualified. Then he learned of a practice called avoided deforestation, which grew out of new thinking in the late 1980s among innovative organizations like Conservation International, The Nature Conservancy and Brazilian NGO SPVS. The idea was to generate carbon offsets by saving endangered rainforest rather than by planting new trees. It might have been cool with him, but it wasn’t cool with some of the more traditional environmental groups like Greenpeace and Friends of the Earth. As the Kyoto Protocol took shape in the 1990s, they made sure avoided deforestation wasn’t part of it. The concept was deceptively simple: find a patch of forest that’s about to be destroyed, measure the carbon content of that forest, save the forest, and earn credit for the carbon that you keep locked in trees. In practice, it was much more complicated than that. First, you had to prove that the forest you were saving really was endangered. Then you had to prove that your actions saved it, and finally you had to prove that the forest you saved didn’t result in another patch of forest being destroyed elsewhere. The Seruyan Forest he was traveling to was definitely endangered: palm oil company PT Best had a concession to develop it, and the company had already developed 10,000 hectares. He hoped that Birute Galdikas could help him identify a way to save it. The bigger challenge was to make it work financially, but the biggest challenges of all came from two sources. One, as expected, was PT Best, which would use its economic and political muscle to try to block the project any way it could. The other chalenge came from a source he hadn’t anticipated: old-school environmentalists who seemed to hate REDD almost as much as PT Best did. On the economic front, Lemons found that-despite all the talk to the contrary, REDD wasn’t a lucrative endeavor, and it probably never would be – especially compared to Palm Oil. At the time, most of the REDD research was focused on the Amazon, so he used the well-researched Brazilian forests as a model. He knew that a forest there held an average of about 200 metric tonnes of carbon per hectare. That translates into 200 tonnes of carbon dioxide kept out of the air over the 30-year lifespan of a forest-carbon project. At $7 per tonne of carbon dioxide, that’s $46 per hectare per year – and that’s just income. He had no idea what it would cost to measure, monitor, and protect the forest, which meant he couldn’t even begin to calculate the profit. The calculus on palm oil plantations was, by comparison, incredibly straightforward: a typical plantation generated $1,000 per hectare per year in pure profit once it was up and running, and if the original forest had enough timber, the palm-oil plantation might even turn a profit on the conversion. While the prices of carbon offsets and palm oil both fluctuated, carbon prices weren’t going to increase twenty-fold, and it was clear that it would be more lucrative to destroy a forest than to save it – a fact lost on many of the organizations involved in the REDD debate. Proponents tended to talk of REDD as an “incentive” to save forests, while critics talked of it as some diabolical scheme hatched by the remnants of Enron to commoditize forests. Proponents, in other words, talked of a green utopia, while opponents talked of “carbon cowboys” and “land grabs.” Both sides were wrong. REDD didn’t create an incentive to save forests, because anyone who responded to purely economic incentives would opt for palm oil. What REDD did create was a financing mechanism that might make it possible for people who wanted to save the forest to do so. To make matters worse, the land-grab that REDD opponents worried about had already happened, but the grabbers weren’t “carbon cowboys.” They were palm-oil developers like PT Best, which was in the process of devouring the Seruyan Forest. The grabbers in turn sold their palm oil to companies like Bunge, Cargill, and Unilever, who put it into foods that the rest of us bought and ate. To stifle climate change, he says, we have to change global buying patterns, but REDD is more of a supply-side solution, analogous to the cut-to-order procedures he implemented in Latin America. It’s one tool in a very big box that includes organizations like the Roundtable on Sustainable Palm Oil (RSPO), which aims to promote sustainable sourcing of palm oil, and even old-school environmentalists to put pressure on those companies that need some prodding. Lemons says those tools all fit together: by putting a price on degradation, he says, REDD will eventually help consumers understand the true cost of their purchases. On a more immediate level in the short term, REDD can be used to leverage more efficient land-use practices among producers – by shifting production from forested lands to degraded lands, for example, as the Indonesian government advocates. There’s something else, too, and for Lemons, it was critical: REDD, he says, unites economy and ecology by turning conservation into a business, while old-school environmentalists embraced a false dichotomy between growth and conservation. But for REDD to work as a business, Lemons would have to show that the returns – while nowhere near as lucrative as a ravenous sector like palm oil – were still worth pursuing. Then he’d have to attract investors, and the only way that would work was if the forests stored enough carbon to make the returns worthwhile. As Lemons looked out at the scraggly trees zipping past his car window on his way to Seruyan Forest, he knew there wasn’t enough carbon in them to fund a kindergarten – let alone take on a palm-oil company looking at a $150-million-per-year business. He also knew that any hope lay not in the trees, but in the soil. That’s because the Tanjung Puting National Park is a massive lowland swamp with trees in it, and those trees have been dropping leaves into water for 10,000 years. Those leaves have coalesced into a half-decayed loam of organic matter up to ten meters deep. Birute Galdikas with two orphaned orangutans. Environmentally, the park and the Seruyan Forest that PT Best was converting to a palm-oil plantation are massive bins of carbon that extend to the mangroves along the Java Sea. As companies like PT Best destroyed the forest to make way for their plantations, they were releasing hundreds of millions of tons of carbon dioxide into the atmosphere. That’s what made Indonesia the world’s third-largest emitter of greenhouse gasses, behind the United States and China. It’s why Lemons needed to save the Seruyan Forest. But for that to work, he had to know how much carbon was in those peat swamps and how much would be released if PT Best continued destroying them. That was a question no one had answered because no one had written the calculus for it. Lemons certainly didn’t know that as he climbed out of the taxi at Galdikas’ orangutan care center, but he sensed that she could somehow help him find the answers. Unfortunately, he’d neglected to tell her that he was coming. Next Week: Wrestling with orangutans: The genesis of the Rimba-Raya REDD project.